We have scored some brownie points in implementation of Kamalesh Chandra GDS Committee though not to our satisfaction. For this achievement we had to wage a relentless struggle. You will agree that struggles requires and resources and we managed the affairs with our reserve fund. We are aware that the department has played tricks in manipulating and distorting the committee’s report to the detriment of the GDS employees. And we shall have to be ready for a given fight. We are on the course of another struggle. We have submitted our list of issues which require solution. The department has adopted such tactics which have deprived us of our legitimate amount of arrears as recommended by the Committee. The date of effect of the new pay matrix from 01/07/2018 has hit us hard by inflicting cumulative losses which are hard to repairs several recommendations have been arbitrarily slashed while several vital recommendations appear to have been thrown into cold storage. Shall we tolerate such injustice hands down or fight it with all our force? Certainly we shall strike hard to achieve every single pie that due to us. And struggles require resources. You will agree that your CHQ had to wage relentless struggle and has been able achieve some success. But in such struggles we used all our resources and the position today stands is that the CHQ is running short of funds. We may be required to take recourse to legal fight in courts on several issues and all these require fund and money. May your CHQ, therefore appeals to our Divisional and Branch Secretaries to rise to the occasion. We understand that the arrears have been paid by now. Our appeal is that the Divisional/Branch Secretaries should raise CHQ struggle fund at the rate of Ks 100 per member and send to the CHQ by crossed D.D. to the CHQ. We sincerely hope that our appeal will be honoured. Dear Comrades, for some times, the CHQ is not receiving due quota from the Divisional/ Branch Unions which has aggravated the situation still more. 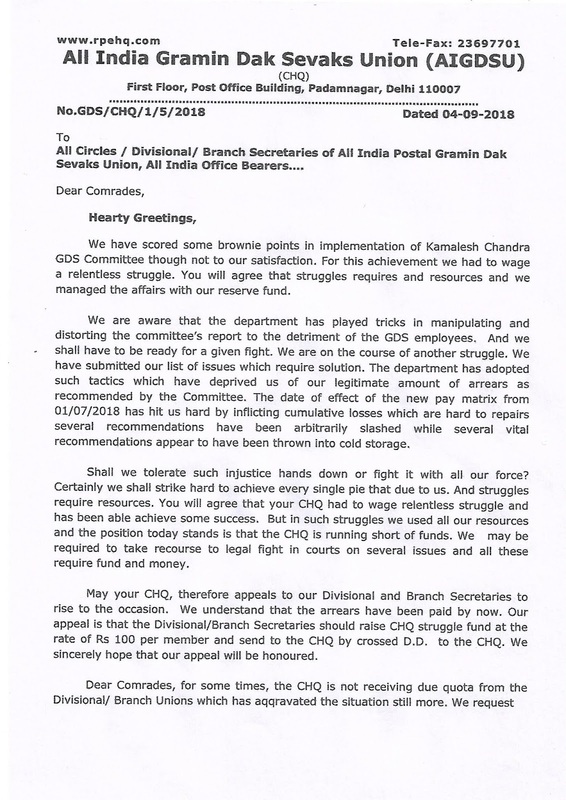 We request our Divisional/Branch Secretaries to clear all arrears of quota and send the amount by crossed Bank draft. We note with sorrow that the Contribution to our union journal “Rural Post Employees” has drastically came down, you may please note that you cannot get the information through what’s App or internet that our journal will provide. Comrades, you are aware that Kerala has been reeling under severe floods which has created severe devastation. Humanity is trouble. The CHQ has donated an amount of Rs 10,000/-. 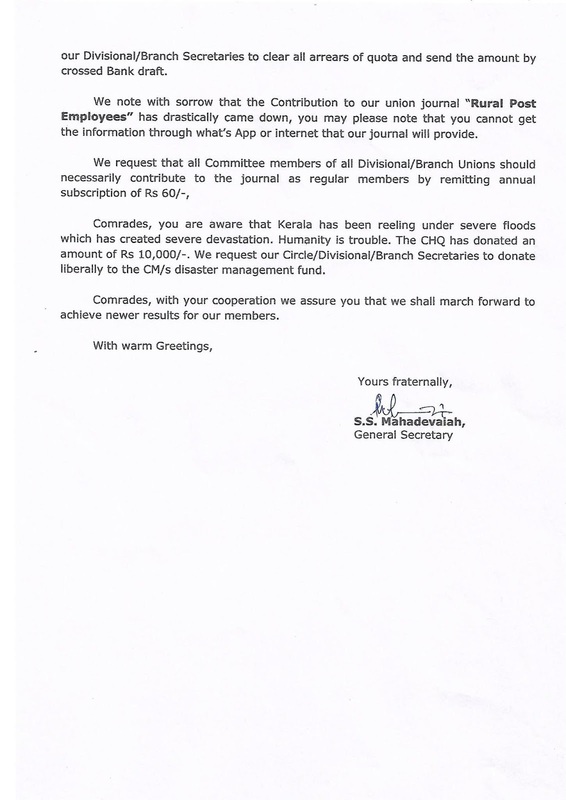 We request our Circle/Divisional/Branch Secretaries to donate liberally to the CM/s disaster management fund. Comrades, with your cooperation we assure you that we shall march forward to achieve newer results for our members.